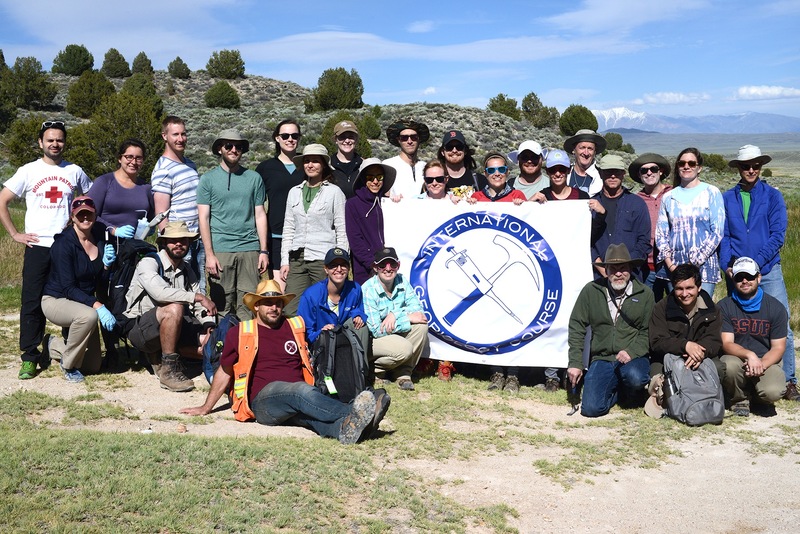 After an amazing research trip to Sierra to study Mono Lake and the surrounding environment, the International Geobiology Course is at the Wrigley Marine Science Center for a few weeks as the final leg in our field-based summer course for top graduate students in geobiology from around the world. The course began in 2002, and you can keep an eye on these students to become leaders in the field. Several of the students are the graduate students in the labs of previous Geobiology students! This class of students has been spending long days in lectures on everything from the Triassic-Jurassic mass extinction to the application of trace metal isotopes to understanding the evolution of ancient metabolisms. Most days also involve several hours spent in workshops on the analysis of environmental metagenomes, computational modeling, and carbon mass balance calculations. After evening talks by prominent geobiologists from all around the country, the students have been… going for midnight swims? Watching movies? Sleeping? Nope, they’ve been in lab, elbow-deep in mud. It’s not just mud, however. Look closer, and you’ll see splotches of green “hairs” on the surface. These are cyanobacterial mats. 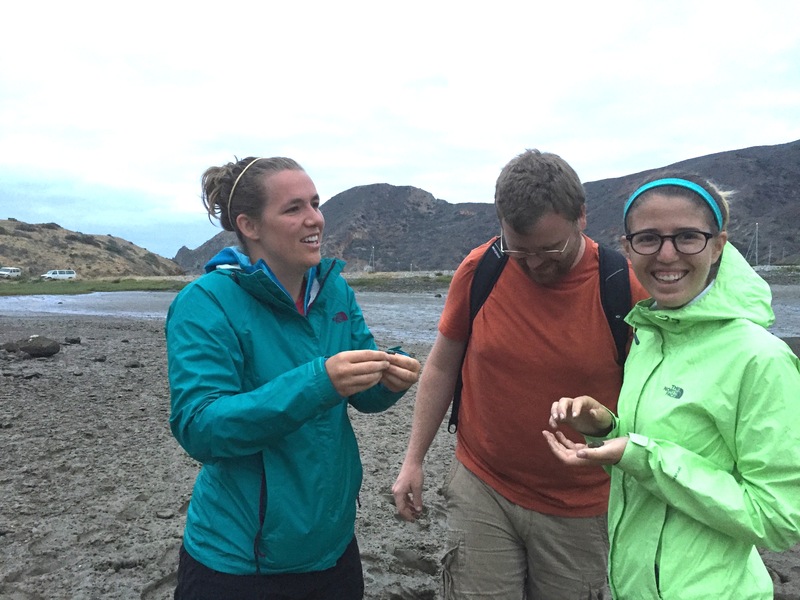 On one of our first days on the island, the group took a field trip to Catalina Harbor on the opposite side of the isthmus from Two Harbors to see the microbial mats that grow in the quiet tidal mud flats. 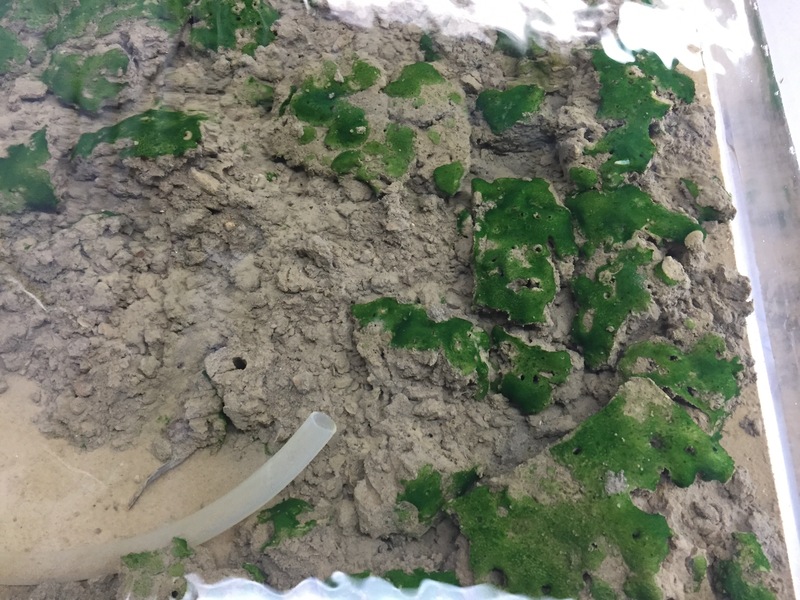 Students woke up at 4:30 am to catch a minus tide, and as the sun slowly came up watched the mud turn several shades of green, announcing the presence of dense bundles of filamentous cyanobacteria. Cyanobacteria are bacteria that do the same sort of photosynthesis that plants do, harnessing sunlight to split water, fix carbon for growth, and produce oxygen in the process. It was some ancestor of these cyanobacteria that first invented oxygenic photosynthesis a few billion years ago, forever changing the composition of our atmosphere, the geochemistry of our planet, and the evolution of life (we would not be here without that oxygen that cyanobacteria first produced!). There’s a lot that these mats can tell us. In past years, students of the GeoBiology course have done experiments to investigate how these mats trap and bind grains and potentially build structures that we see in ancient rocks. Some of this work has resulted in the publication of scientific papers. This year, the students are interested in something new—it seems that it’s not just cyanobacteria in the mats. There are other long, stringy (filamentous) organisms living deep inside, organisms that, based on some initial microscopy work, we think may be oxidizing sulfide (the chemical that causes rotten eggs to stink). To do this, the students have filled the laboratory seawater tanks with handmade experimental boxes packed with mats that were treated in different ways to favor the growth of cyanobacteria in some boxes, sulfur oxidizing bacteria in other boxes, and sterile controls in additional boxes. In a few days, they will pull the boxes off and see how well the mud stays together. If the experiment works, the students hope to present the results at the annual American Geophysical Union Meeting, and blow some minds. Meanwhile, there’s a lot of other work going on. Jars on the lab benches filled with different types of rocks are hooked up to carbon dioxide monitors—the carbon dioxide levels in the jars are going down over time, and different rocks do this at different rates. Computers are humming while they crank through several terrabytes of gene sequence data from some unique field sites, including a hot spring, Mono Lake, and a lake in Nevada that seems to be actively growing large carbonate towers; the students hope to use the sequence data in combination with a ton of environmental chemistry data to understand which organisms and environmental parameters might be influencing the interesting structures we see in these environments…and how the environments are influencing the different types of organisms present in the environments. And there’s more data on the way. All too soon, students will leave the island, exhausted from all of the hard work, yet energized with new ideas and a unique breadth of scientific training. But its not really goodbye. We’ll see many of them again at scientific meetings in the years to come, presenting the work they did this summer as well as work done in their home labs applying the techniques and concepts they learned to their areas of interest. Carie is a former International GeoBiology Course student, current course instructor, and new faculty at Weber State University in Ogden, Utah. This entry was posted in Graduate, Wrigley Institute on July 19, 2016 by Jessica Dutton. The quote “Don’t rule out working with your hands; it does not preclude using your head” by Andy Rooney summarizes the last six months of my PhD dissertation work and my current work as a WIES Summer Graduate Fellow. Back in January 1, 2016, the aquaculture side of the new greenhouse facilities (appropriately dubbed the ‘blue-house’) was little more than an empty room with loads of potential. Since then, I have focused on developing a state of the art aquaculture science facility in the space, with a little help from my friends – to use another famous quote. This process was literally a lesson in construction for me, and I thoroughly enjoyed the manual labor involved. Building shelving, designing and prototyping tank systems, pumps, sumps, broodstock tanks, storage areas, and then plumbing it all together: this was my work for the first months of 2016. My beard was often full of sawdust. Though I had many nights where I dreamt of leaking tanks, missing bolts, and other water related catastrophes, watching a finished product emerge from a brainchild was an extremely rewarding experience. The brand new “blue-house” facilities at WMSC. The right half of the photo displays our broodstock holding tanks, spawning stations, and general working areas. The left portion of the photo shows the family line system with smaller tanks for holding young shellfish. So what’s in our new blue-house space? First, we designed several broodstock holding systems, to house the adult animals that we use for hatchery science. These include the Pacific Oyster (Crassostrea gigas), the Purple Sea Urchin (Strongylocentrotus purpuratus), the California mussel (Mytilus californianus), and the Mediterranean mussel (Mytilus galloprovincialis). Each of these animals needs adequate space and clean salt water, so we have several temperature controlled systems as well as large ‘raw’ seawater holding tanks for these critters. But they also need to eat! So we grow large amounts of concentrated algae by building a series of ‘sun-cones’, each with 200 L capacity. These large conical tanks sit in front of specially built sun lamps and a reflective board to encourage their growth, and are also exposed to natural sunlight throughout the day. 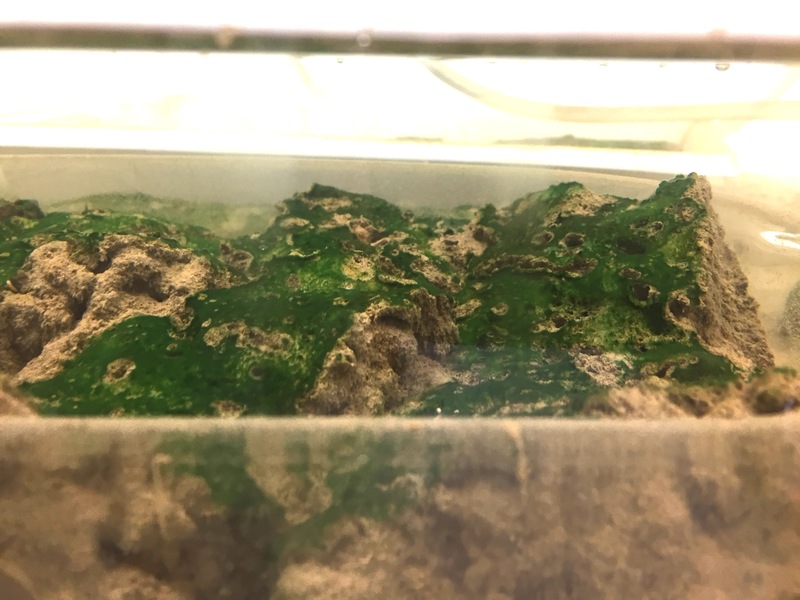 Thus, we are able to grow algae (primarily Tetraselmis spp. and Isochrysis galbana, for inquiring minds) in large quantities, which adds a splash of cool green and brown colors to the lab. Finally, when we spawn ‘families’ of bivalves we need places to raise them, and so I designed an ergonomic, science-scale rearing system. This involves a series of 50 tanks with conical bottoms for easy drainage. Each of the tanks has a direct seawater input and drainage, and a mechanism called a ‘banjo screen’ to keep animals in and water flowing through. When running at full steam, the capacity of the system is approximately 1400 L of seawater, and can be operated on one of three modes: static, flow-through, or closed circulation. Apologies if that sounds a bit like industry jargon to a person unacquainted with hatchery systems, but what this essentially means is that our systems allows us to control temperature, feeding rates, and other environmental dynamics in all 50 tanks simultaneously. This streamlining is what really makes our system unique, and will allow our team to develop genetically distinct groups of animals (more on that later). All of these systems, of course, require a large amount of seawater, which is directly piped into the lab and sent through a series of UV (to kill bacteria) and particle filters. 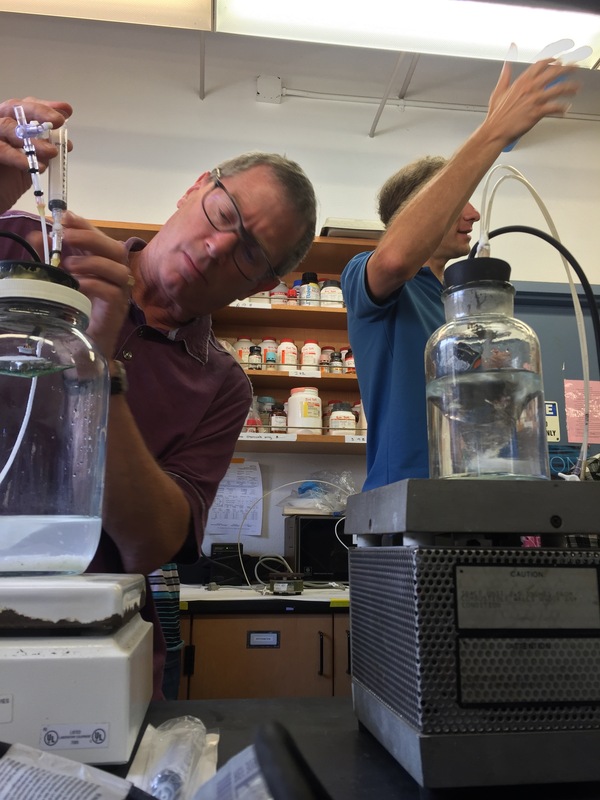 WMSC actually has some of the most pristine and stable seawater of any marine lab on the US West Coast, due to consistent currents and a well-placed intake source just outside of Big Fisherman’s Cove. The organisms we keep in the blue-house from left to right: the Pacific Oyster Crassostrea gigas, the California Mussel Mytilus californianus, the Mediterranean mussel Mytilus galloprovincialis, and the Purple Sea Urchin Strongylocentrotus purpuratus. All are important to science – and all are delicious! So what am I doing with this system? My research in these facilities has two components for the summer of 2016. One half of my work involves understanding the genetics of domestication in bivalve crops. Nearly every major food staple we eat has had some sort of ‘domestication’ process behind it, which is usually as simple as selecting the biggest and best from a given population (corn, grapes, pigs, cows, dogs, beans, etc. etc.) and letting these propagate the next year’s crop. Through many iterations of this process – think: thousands of years – we arrive at a vastly different and ‘improved’ food item. This method, also known as artificial selection, leaves a genetic signature in the organism. But shellfish have not had anything like this done to them before. In other words, if you wanted start your own oyster farm tomorrow, you would be just as well off picking up random animals from the beach. This would be akin to farming wild boars for bacon, a daunting prospect! I am jumpstarting this thousands-of-years domestication process by understanding the genetic signatures of domestication in other crops, and comparing that to shellfish crops. In the end, I hope to provide aquaculture farmers with a better strategy for growing larger quantities of these sustainable (and tasty!) bivalves as the world’s human population increases. The second half of my work this summer involves understanding how metal toxicity in marine environments affects bivalve larvae. Working with Emily Cheung, a sophomore at Skidmore College in the WIES Research Experience for Undergraduates (REU) program, we are using an automated tracking software developed by lab to measure larval movement patterns in toxic conditions. Namely, we want to understand how increasing loads of copper in the water column affect swimming behavior. So why copper? Antifouling boat paint is extensively used in marine environments, and the key ingredient is copper! This leaches into the salt water, and becomes ‘bioavailable’ to marine organisms, and at large loads can become highly toxic. Early results suggest that copper loads indeed do affect how much bivalve larvae actively swim, though many more tests need to be done to confirm this finding. If we can demonstrate a behavioral change in bivalve larvae due to metal toxicity, we may be able to influence regulations regarding runoff, and better predict consequences in heavily utilized boating areas or in scenarios of large spills. These projects are very much a work in progress (sawdust can still be found in my beard), so please stop by the blue-house when you are out on the island and check out our facilities! Nathan is a WIES Summer Fellow and graduate student in the lab of USC Professor Sergey Nuzhdin working on Aquaculture-Science Development, with a focus on genetic improvement of commercial species. This entry was posted in Wrigley Institute on July 19, 2016 by Jessica Dutton.